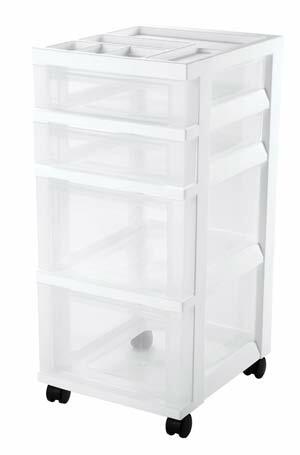 5 high rated mobile plastic storage containers with drawers – do they live up to the mark? Keeping your pens pencils brushes paints and every other piece of art equipment organized and mobile in portable storage carts with wheels makes perfect sense. 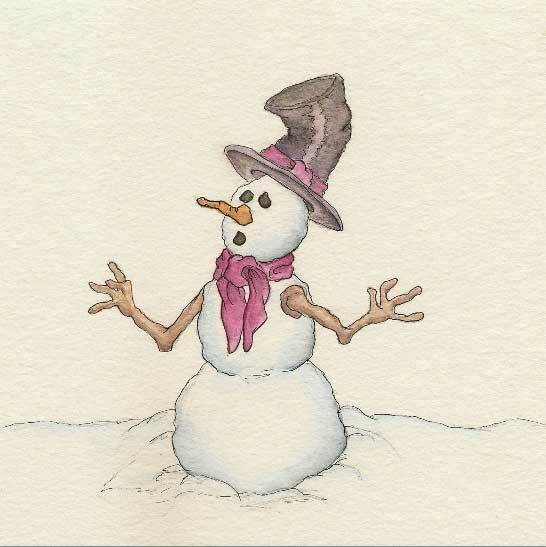 Quickly to hand and without having to wade through a pile of artists tools on the work-surface. The solution is relatively cheap, space saving and will save hours of frustration looking for that missing pen if you have a rolling utility cart with drawers. We review five mobile storage carts with high customer ratings but are they meeting the ratings? 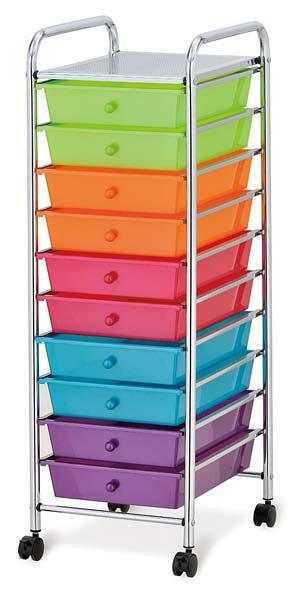 10 colored plastic storage drawers contained in a chrome steel frame with two locking black casters. Each drawer has an internal dimension of 13.5″ x 9.5″ x 2.6″. 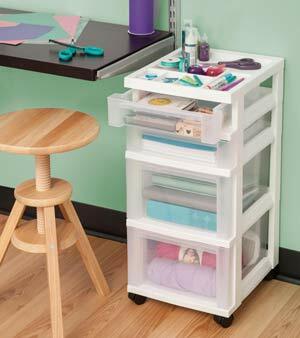 This is an ideal unit for multi-purpose and would suit any artist or crafter with the color coded drawers. The unit is supplied as a self assembly pack which is easy to assemble (tools provided). There are some negative comments regarding the appoint of storage each drawer can take. The stipulated weight load is 3.3 lbs per drawer, 16.5 lbs top fixed shelf with a total load of 49.5 lbs. Positive reviews point out that there is nothing wrong with the cart with sensible loading. The overall Amazon star rating is a descent 4.3. This is a nice unit which, with 10 draws and a narrow profile will store plenty without taking up much room. There are another four variations on this 10 drawer rolling cart for you to consider (follow link below or click image). 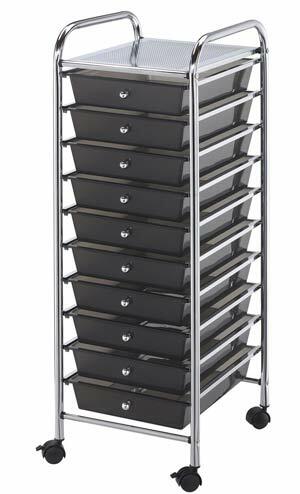 Twelve heavy duty opaque plastic drawers mounted on a sturdy chromed steel frame with four locking casters. This provides a large surface on the fixed top shelf and at 29″ high is ideal for carrying out art and craft work or additional storage space. 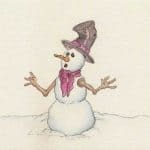 The overall size of the unit is 15.25″ x 25.25″ x 31.75″ which is reasonably small to fit into your art studio yet late enough in drawer volume to house a considerable amount if art and craft tools and supplies. The total weight is 16.5lbs. The sliding drawers are semi-opaque making it easy to see into the drawers to locate items. There are four large draws which allow for bulkier items to be stored. This is a self assembly unit with all instructions and tools provided and is relatively easy to construct (there is also an online video provided in addition to written instructions). 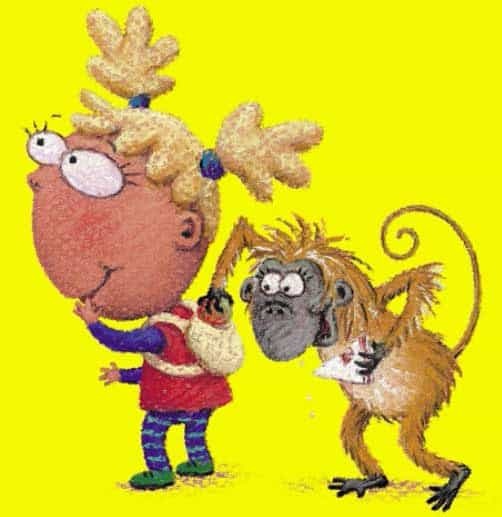 There were a few niggles in the comments left by reviewing customers but these were generally small individual issues that were ironed out. The overall opinion seems to be good with an average 4.1 Amazon customer star rating. 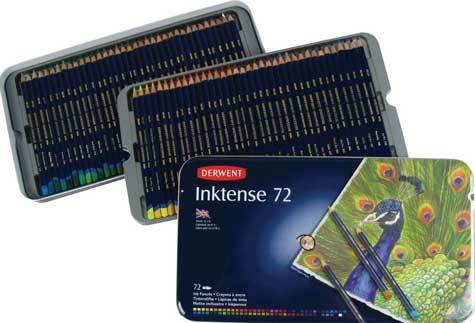 For arts and crafts this seems to be another good buy with a large workspace area on top – a great storage tool. 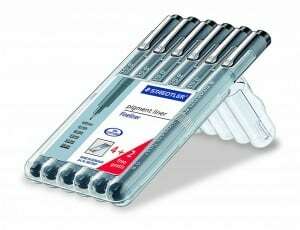 20 sliding plastic draws set in a sturdy tubular chromed steel frame with four casters (two locking). The metal fixed top shelf provides a large workspace for arts and crafts or for additional storage. The twenty sliding drawers are 11.25″ x 15.4″ x 2.75″ and the total size of the cart is 24.75″ x 15.4″ x 38″ with an overall weight of 50lbs. Semi opaque drawers making it simple to locate ant art/craft materials. This cart has a 4.3 Amazon star rating from existing customers. 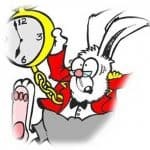 However after delving through some of the negative reviews there appears to be a consistent fault with drawers not fitting correctly after prolonged use and being difficult in some instances to pull in and out. This particular cart has a relatively higher price tag than others in this review and you might want to bear these observations in mind. 0n the plus side 4.3 Amazon star rating is still very good and there are 8 different sized carts available (on the link below) ranging from 3 to 20 drawers. 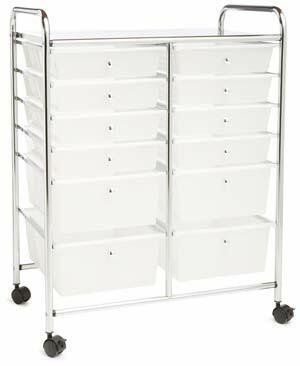 Ten plastic sliding drawers smoke colored set in a chromed steel frame on four casters (two with locks). 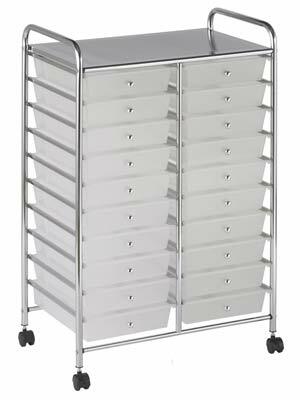 This is the second cart in the review with tall narrow plastic drawers for space saving. The unit requires self assembly with tools and instructions provided and previous customers have stated that it is very easy to put together. Although this is highly rated overall (4.1 Amazon customer star rating) there is a down side that may be critical for art and craft use. There are quite a few customer reviews that say the cart is ‘flimsy’ and won’t take much weight. As this seems to be a consistent complaint it may not suit you especially if you are storing heavier objects such as reams of card/ paper. The Iris 4 Drawer cart is different both in appearance and construction to the other carts in this review as it has an organiser on the top which is ideal for storing arts and crafts materials that you need immediately to hand. The cart also comes in one piece so there are no assembly issues. There are two shallow (12.8″ x 9.8″ x 2.9″) and two deep drawers (12.8″ x 9.8″ x 6.8″) and the total unit size is 14.2″ x 12″ x 26.4″ and 6.5 pound which is considerably lighter than the other carts due to the plastic construction. Amazon Customer reviews give an average 4.4 star rating and there are a lot of positives that go with this purpose built cart as it. There are a few negatives but these are mostly ‘in transit breakages’. The downsides are that the cart is generally smaller and the drawers do not pull all the way out as they are fitted with ‘drawer stops’. If these issues don’t deter you this looks a really good storage unit particularly for art and craft materials. Conclusion – which rolling cart with drawers is the best? Of the five mobile plastic storage containers with drawers two stand out. 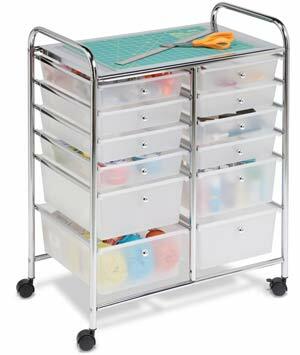 The highest rated Iris 4 drawer cart is perfect for art and craft materials. Although the unit is a relatively small rolling cart with drawers it has a purpose built shaped top plus shallow and deep drawers to accommodate items of different shapes. As an added bonus you not have to assemble the unit! If you are looking for plenty of space to store plus a decent work surface we recommend the Honey Can Do 12 craft storage carts on wheels. 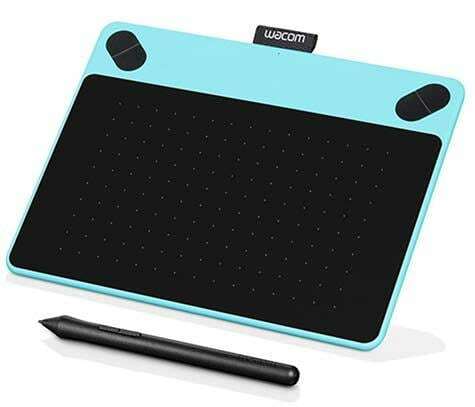 Best Tablet for the Money – 5 Drawing Tablet Reviews	Which is the best drawing tablet for beginners?